August 31, 2017 – Sea ice in the Arctic Ocean is in a downward spiral, with summer minimum extents about 40 percent smaller than in the 1980s. But predicting how the sea ice is going to behave in a particular year is tricky: There are still many unknowns about the conditions of the sea ice cover, to say nothing of the difficulties of forecasting weather and ocean behavior over seasonal timescales. NASA researchers are working to improve their forecasts of the size of the Arctic sea ice cover at the end of the summer melt season — but the goal is not just to have a better prediction of sea ice coverage. The challenge of making summer sea ice forecasts allows scientists to test their understanding of the processes that control seasonal sea ice growth and retreat, and to fine-tune computer models that represent connections among the ice, atmosphere and ocean. A grassroots initiative launched in 2008 compares the efforts of different research teams each year to predict end-of-summer Arctic sea ice. This year, three NASA teams are among over three dozen groups that submitted at least one prediction. The participating groups in the Sea Ice Prediction Network (SIPN) use different methods, ranging from statistical analysis to dynamic models, gut feelings and combinations of techniques. Teams can submit forecasts in June, July and August based on the current sea ice conditions at those times. Each fall, the project releases an analysis of the year’s submissions, reviewing lessons learned and providing guidance to future research efforts. The comparison of different methods allows scientists to go beyond simply collecting observations of sea ice characteristics to test hypotheses about the drivers of sea behavior in a particular year. As an example, such methods will allow researchers to more closely examine the impact of summer ice thickness or the presence of melt water ponds at the beginning of the melt season. It will also let them determine whether a singular characteristic of the ice is more useful than analyzing a combination of factors. Among other data, the participating teams use sea ice concentration — how much of a given area is covered in ice — and extent, which takes into consideration all areas of the Arctic Ocean and surrounding seas where ice covers at least 15 percent of the ocean surface. Higher sea ice extents and, more importantly, higher concentrations make the ice more resistant to melt, because less of the ocean is exposed and thus less able to absorb solar warmth. The concentration and extent datasets are based on methods developed back in the 1970s and 1980s by scientists at NASA’s Goddard Space Flight Center in Greenbelt, Maryland, and currently curated by the NASA data archive at the National Snow and Ice Data Center (NSIDC) in Boulder, Colorado. In addition, a long-running NASA aerial survey of polar ice called Operation IceBridge provides measurements to SIPN teams on spring sea ice thickness, melt ponds and snow conditions, which are three other parameters that influence the summer melt season. Alek Petty, a sea ice researcher at Goddard, has submitted forecasts to SIPN for the last two years that are based on a statistical model that analyzes satellite measurements of sea ice concentration and melt onset. 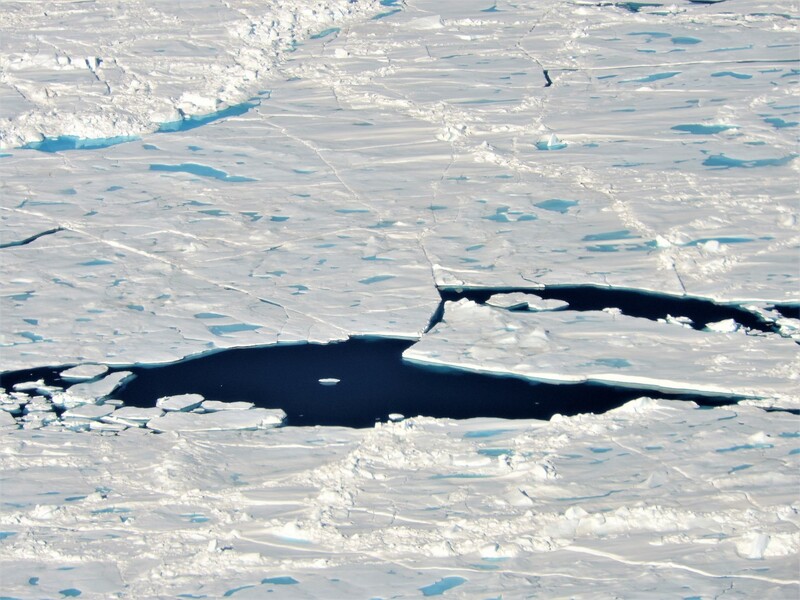 One aspect of the summer melt season Petty tests with his model is the question of how melt ponds — the bright blue puddles of melt water that appear on the sea ice in the spring and summer — can also help predict of the extent of sea ice at the end of the summer. Petty can run his model with data on the spring melt pond coverage obtained by a climate model run by researchers in the United Kingdom. Richard Cullather, a climate modeler at Goddard, uses a dynamic model of the climate system that takes into account the interactions among Arctic sea ice, the ocean and the atmosphere. This year, his fourth participating in SIPN, he applied sea ice thickness measurements from satellite data to define the conditions of the sea ice pack before the beginning of the melt season. Cullather expects that this addition will improve the forecast. NASA IceBridge data, along with measurements from ESA’s (European Space Agency) CryoSat-2 satellite, provide key thickness information. With NASA’s Ice, Cloud, and land Elevation Satellite-2 (ICESat-2), a mission scheduled to launch in 2018 that will measure the height of the sea ice above the ocean surface, improved thickness information will become available to inform melt predictions. Finally, Walt Meier, a sea ice scientist who worked at Goddard until July and is currently with NSIDC, uses a simple statistical method that looks at the total extent of sea ice from 2005 to 2016 and averages the daily changes in extent day by day through the end of September. “I only use data from the past 12 years because before 2006, the edge of the sea ice pack at the beginning of the melt season was located much farther South, so it would melt more quickly in July and August than it does now,” said Meier, who has participated in SIPN since its beginnings and is a member of the leadership team. Despite the sea ice pack starting the melt season from a record low maximum yearly extent in March, none of the predictions from Petty, Cullather and Meier call for this year’s September extent to be less than that of 2012, which is the lowest ever observed during the satellite record of Arctic sea ice measurements that began in 1979. Still, their forecasts are suggesting an extent in line with the Arctic sea ice’s long-term downward trend. A common challenge to existing forecasts is that as the sea ice has dramatically thinned over the past decades, the impact of weather phenomena such as large summer cyclones on the ice cover has increased. Also, weather cannot typically be predicted more than 10 days in advance.